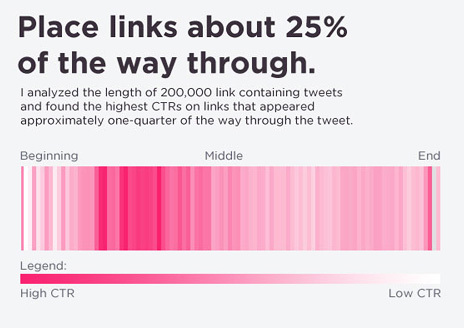 When it comes to sharing links through Twitter, what makes them click? Dan Zarella from HubSpot set out to answer that question, analyzing over 200,000 link-containing tweets, and measuring several characteristics that appear to influence click through. 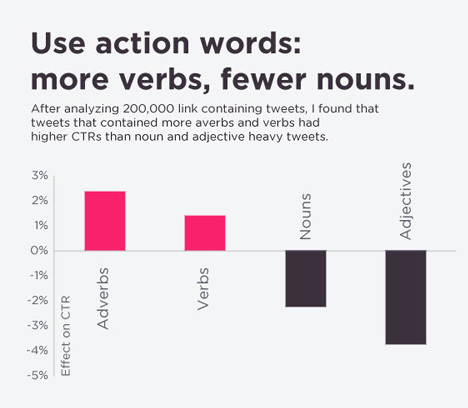 Dan’s findings are presented infographically (WordPress tells me this is not a word, but I don’t care), which we will here break down tip-by-tip, along with some real-world examples. If you’re anything like me, your problem is trying to fit your message into a measly 140 characters. It’s reassuring that longer tweets don’t underperform shorter ones. But why would longer tweets get higher click through? Does that mean never tweet short? No way. If you can evoke curiosity with a few words, do it. This funny looking graph reveals that links at the beginning are cold, at the end are lukewarm, and a quarter of the way through are hot. I think this is a safe practice to adopt for every tweet – for whatever reason, it seems to work. But why does it work? My theory is it has to do with the way we scan the web. Links at the end, well they trail off, and may be noticed less, similar to a cart button placed too far away from product info. But consider it’s not all that important for some links to be clicked. 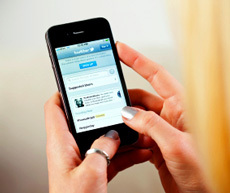 Tweets are often posted simply to share interesting facts and ideas. Rand Fishkin’s tweet above is a stand-alone statement. He links to his inspiration as a reference, rather than a destination. A low click through rate would not be a failure. Here’s a tip: ask your tweet-fluencial friends to share your website links using via, @you or RT if they’re not already. “Lomography is steadily growing and expanding its physical presence within the UK” is more interesting than “Lomography is growing and expanding its physical presence within the UK.” Steadily suggests there are some insightful details after the click on “why” the company is growing. Adverbs work best if they add some interest to the subject matter. 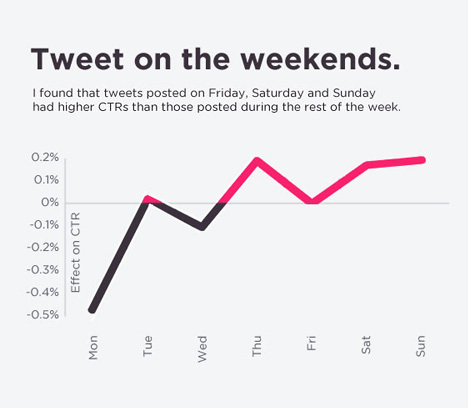 No surprise here, tweet volume from marketers is understandably down on the weekends, so there’s a better chance your links are seen by weekend socializers. Schedule tweets in advance with Crowdbooster or Hootsuite, and of course monitor click-through vis-a-vis similar links during the work week. Another tip: Check out (ah, see what I just did there?) Tweriod, an app that will tell you your ideal time to tweet based on your audience. Hashtags are styled like links and could “drown out” the call to action. Do they help or harm a tweet? Affirmative verb at the beginning of the tweet? Does using a command at the beginning of a written sentence have the same impact as it does spoken (as in neuro-linguistic programming)? Link shorteners conceal the domain behind the link, while truncated links may give clickers more confidence. 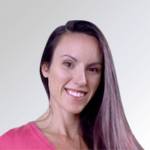 They’re also longer, which may draw more attention (like a big checkout button). Does it matter? Do WORDS IN CAPS, little triangles or musical notes attract more attention? 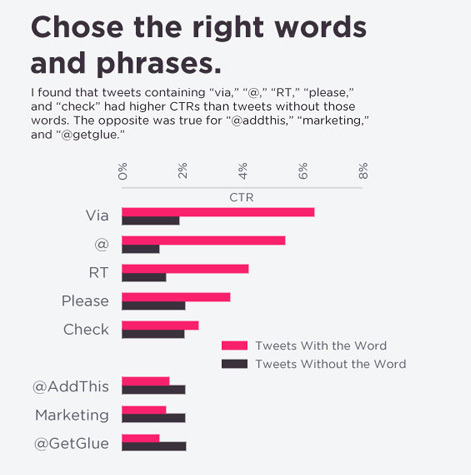 While they may not influence clicks, if the tweet is more likely to be noticed in the first place, it naturally has a higher chance of getting clicked. Do links from Tweetphoto, Yfrog or Twitpic win more clicks because people crave multimedia content? How can Tweets be tested? 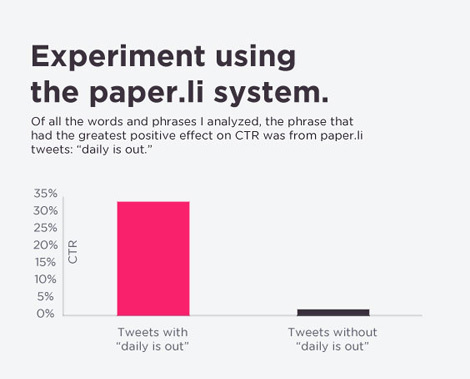 Unfortunately, it’s not possible to A/B test tweets – yet (maybe someday there’ll be an app for that). If you’re handy with numbers, Rand Fishkin from SEOmoz has a process for hypothesis testing tweets you can try. 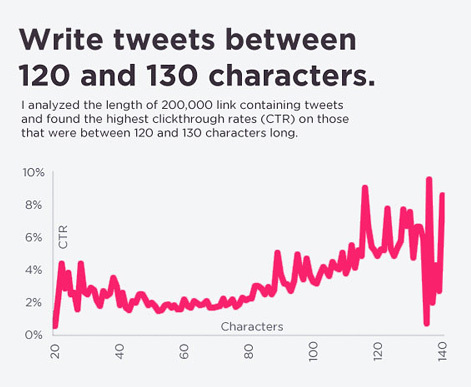 (Interestingly, Rand found shorter tweets produced higher click through in his analysis). Again, click through isn’t the perfect measure of engagement or interest. You can’t count how many people read your tweet and got value out of it without retweeting or replying to you, but you can measure which tweets spurned the most unfollows with Tweeteffect. It’s a good idea to make note of content that causes an unusual exodus, regardless of the length, link placement, use of adverbs or time of day.